Health Care Act (AHCA) of 2017. "It’s a momentum issue. The fact is that, you know, you came out of the gate and you stumbled." On a positive note, tens of millions of people in the U.S. will not lose their health care in future years, and the average life expectancy in the U.S. should not plummet. One factor in the health care debate has seemed strange to me. The nonpartisan Congressional Budget Office had examined the modified version of Ryancare/Trumpcare. On MAR-23, they issued a revised report. It found that, if the modifications had been implemented, the changes compared to the original version of Ryancare would have reduced the savings in federal spending by about 50% even as it would have still caused 24 million people in the U.S. to lose their health insurance in the future. Recent reports in the media frequently repeated the 24 million figure. However, after a casual search, I was unable to find a media account that mentioned the inevitable impacts that this would have on those who would lose their health care. Without such care, surely hundreds of thousands would become disabled, develop a very poor quality of life, and unable to work. Also, more hundreds of thousands would die because of lack of access to medical care. Yet the only mention of these inevitable results that I have seen was by Bill Maher on episode S15E09 of his TV show "Real Time with Bill Maher" on 2017-MAR-24. I find that curious. I recall the Sheep and Goats section in chapter 25 of the Bible's Gospel of Matthew in which the "Final Judgment" is described. Jesus is quoted as implying that after death all the people from all cultures and all religions will be judged according to a single criterion: when they were alive on Earth, whether they helped other people in need; people who were hungry, sick, imprisoned, etc. The passage describes how those who did help others by following the Golden Rule were "saved", called "sheep," and would attain Heaven. Those who were not helpful were referred to as "goats" and would be sent to Hell. Assuming that this biblical passage is accurate, I wonder how the Republicans who promoted Ryancare will fare at the Judgment. One of the remarkable features of the photograph is that all of the 26 people visible in the room are male. 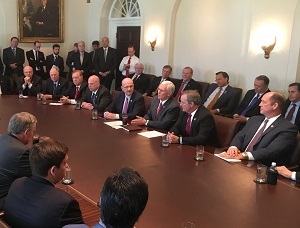 What generated a great deal of criticism is that the topic of the meeting was women's access to maternity and newborn health care under the proposed Trumpcare/Ryancare legislation. To understand the beliefs of a Republican Representative, a two dimensional graph is required. Their graph's horizontal axis shows where the Representative's beliefs are in terms of moderate vs. conservative. The other axis shows where they lie on a more establishment vs. less establishment axis. Much of the opposition to the AHCA was from the Freedom Caucus members who are both more conservative and more in favor of less establishment. Many conservatives were profoundly disappointed because they had considered an end to Obamacare to be their highest legislative priority. Ending Obamacare by repealing the Affordable Care Act and passing the American Health Care Act would have terminated health care for tens of millions of U.S. citizens; probably caused the deaths of tens or hundreds of thousands of Americans; and not avoided disability of hundreds of thousands more. It would also have made a major shift in wealth from the poorest to the most affluent Americans. It would also have defunded Planned Parenthood, terminated that agency's contraceptive services, and indirectly increased the abortion rate. With an approval rating by the public of less than 20% the AHCA might have severely damaged the Republican Party. The Freedom Caucus that was led by Representative Mike Meadows (R-NC) refused to support the American Health Care Act because it still would have left parts of the Affordable Care Act in place and it did not succeed in creating a market-based health care plan. 2% said: Maybe the bill wouldn't have failed if Democrats would have supported it." "... told the president to keep a sh-t list on this. He wants a running tally of [the Republican lawmakers] who want to sink this. ... Not sure if I'd call it an 'enemies list' per se, but I wouldn't want to be on it."